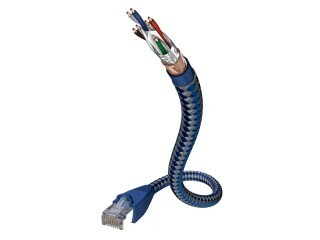 The CAT7 Referenz cable is a LAN cable for high-end network connections. Because of the high production quality, it well surpasses the specifications required by EN50288-4-2 / IEC61156-6 (600 MHz), and reaches band widths of over 1200 MHz. This makes it equipped for high-speed networks with 10 Gbps (10 Giga bits per second). It was however, through exacting maintaining the impedance of its data lines, especially conceived for low-loss HD audio and HD video streaming. The PE-Network Jacket also prevents disturbing microvibrations, while the high-grade CAT Referenz plug rounds the product off. 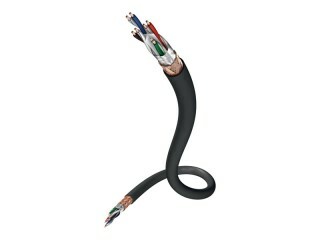 Enlarge The flexible network cable in category 6 in the SF-UTP design has an overall braided and foil shielding and high-quality AWG24 copper wires. Enlarge Network cable in category 6 in SF-UTP quality. Available with solid AWG23 copper conductors for fixed installations or flexible AWG24-copper wire. 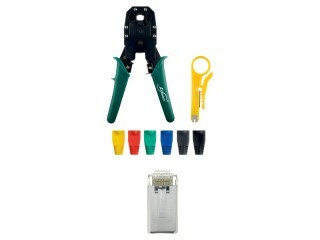 Enlarge The RJ-45 network plug with 24c gold-plated contacts, as well as insulation cover and the right crimping tool for custom-connections.